After travelling the world for a couple of years Sonja and Kevin Bergin decided to buy a home in the Irish countryside, where Kevin had spent a happy childhood. 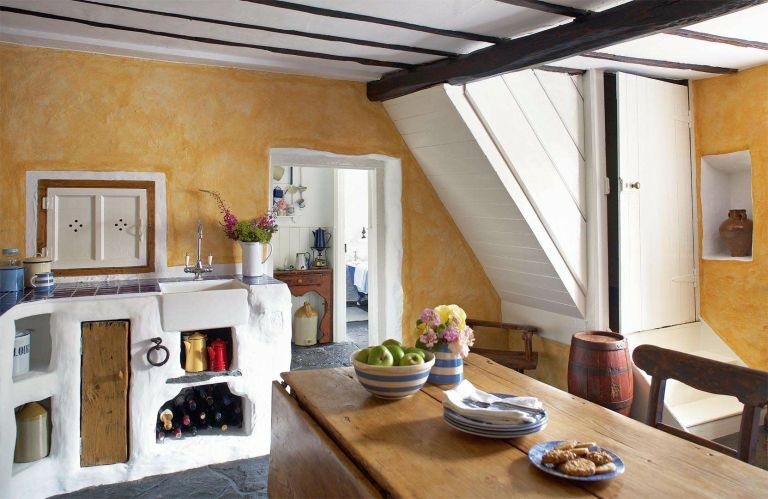 They chose a thatched stone-built cottage and have been renovating for the last two decades. Let their sensitive restoration of their thatch cottage inspire you to embark on your own project. ‘But there was great excitement when we finally got the original key the following summer,’ Sonja adds. Although the property had been empty for 12 years, it had been well looked after: while the roof needed initial repairs, the building was structurally sound. However, there was just electricity in a couple of rooms, no running water and no indoor lavatory. Sonja explains: ‘As Kevin and I didn’t know much about traditional renovating, we hired a builder to bring it up to a habitable standard.’ He put in timber and stone flooring, plastered the walls and ceilings, built a partition wall for the bathroom and inserted a staircase for the master bedroom, which had been accessed by a ladder. Meanwhile, Kevin wired the property, and his brother-in-law helped him with the plumbing for the bathroom and kitchen. Unfortunately, the work had included finishing some of the walls with concrete; years later, Kevin went on specialist courses and learned that it wasn’t good for the house so set about putting it right. Repairs included chipping back the modern plaster and redoing it with lime, which Kevin mixed and applied himself; with the help of his brother, Joe, he also repointed the walls using lime mortar and finished them with 12 coats of limewash. The limewashed exterior matches the interior style to create a harmony between outdoors and in. Further work has included stripping wooden floors upstairs, painting the floorboards in the master bedroom pale blue, and redecorating. But to complete the biggest job – replacing the thatch – they’ve had to call in professional help.